The igneous ocean crust –the rocky realm of hard volcanic lava exists beneath ocean sediments that lie at the bottom of much of the world's oceans– is largely unexplored and unknown to science.While scientists have estimated that microbes living in deep ocean sediments may represent as much as one-third of Earth's total biomass, the habitable portion of the rocky ocean crust may be 10 times as great. To this day, biologists know very little about this ecosystem. The Integrated Ocean Drilling Program (IODP) Mid-Atlantic Ridge Microbiology Expedition set out to change that. An international team of scientists sailing onboard the research vessel JOIDES Resolution recently returned from installing observatories beneath the seafloor in "North Pond"–a remote area in the middle of the Atlantic Ocean. Scientists hope that data collected from these subseafloor observatories (known as CORKs, or Circulation Obviation Retrofit Kits), along with studies of rock and sediment samples collected during the expedition, will help to shed light on the role tiny subseafloor microbes play in shaping Earth's oceans and crust. Led by co-chief scientists Wolfgang Bach of the University of Bremen in Germany and Katrina Edwards of the University of Southern California, the expedition began in Bridgetown, Barbados, on Sep. 16, 2011, and concluded in Ponta Delgada in the Azores on Nov. 17, 2011. Two CORKs were successfully installed, and sediment and basalt core samples were recovered. CORK observatories are designed to remain in place for up to ten years. The North Pond subseafloor observatories will allow active experiments to be conducted below the bottom of the ocean for as much as five years after deployment. Scientists from the expedition plan to return to these observatories with the first of many submersible expeditions in early 2012. "The innovative and novel experiments and observations from this expedition promise to greatly advance our understanding of the nature and extent of microbial life in the most widespread of environments–the Earth's ocean crust," says Jamie Allan, program director for IODP at the U.S. National Science Foundation (NSF). What is the nature of subseafloor microbial communities, and what is their role in the alteration of relatively young ocean crust? Are these communities unique, particularly in comparison with seafloor and sedimentary communities? Where do microbes in the igneous ocean crust come from (sediment, rock, seawater or another source)? 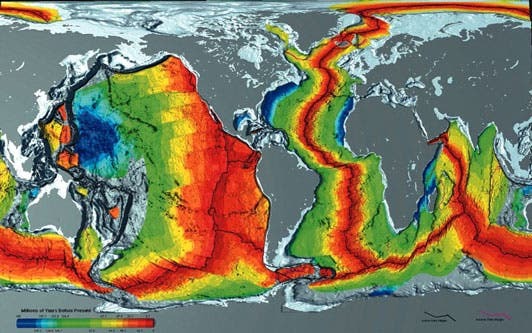 In the image at top of page, the age of the oceanic crust is illustrated by color. The gradation from red to blue indicates increasing age. Blue represents crust created some 180 million years ago. Red indicates oceanic crust created quite recently on the geologic time scale. Center black lines delineate the mid-oceanic ridge volcanic rift zones.